Hair styles, of course, have changed dramatically throughout history and from one civilization to the next. Let's take a quick look back at changing hair styles throughout the ages. 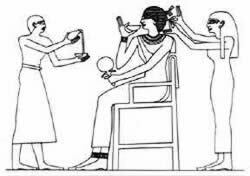 In the heat of ancient Egypt, noblemen and women often clipped their hair close to the head. But for ceremonial occasions, heavy, curly black wigs were worn. Women's wigs were often long and braided, adorned with gold ornaments or ivory hairpins. Men's faces were generally clean-shaven, but stiff false beards were also sometimes worn. In classical Greece, women's hair was long and pulled back into a chignon (a knot of hair that is worn at the back of the head and especially at the nape of the neck). Many dyed their hair red with henna and sprinkled it with gold powder, often adorning it with fresh flowers or jeweled tiaras. Men's hair was short and even shaved on occasion. In austere Rome, the tendency was to follow Greek styles. The upper classes would use curling irons and favored the gold powdered look of the Greeks. Women often dyed their hair blond or wore wigs made from the hair of captive slaves. Later, hairstyles became more ornate with hair curled tight and piled high on the head, often shaped around wire frames. Hairdressing became popular and the upper classes were attended to by slaves or visited public barber shops. In Part 2 of our series, we'll take a look at the Far East, including China and Japan. In the meantime, stop into any Hair Cuttery and get a style for the ages!